I was texting with a mom recently about a play-date we are arranging and it never ever escapes me that I have this conversation now pretty regularly with other parents if we are visiting or they are visiting our home. This is not our parents playdate. Hell, our parents didn’t even know what a playdate was, they just sent us outside to play. These children are 5 years old. I tend to offer up our information as a way of not making it awkward and most folks will reply in kind with their situation. If they don’t provide the information in turn, I straight up ask, “do you have any unsecured guns in your home?” I am not coy, no ma’am. By the words, by the tone, by the possible defensiveness of the answer, it is then up to me if we continue on down this road or not. It is up to me to make the best decision for my kids. Maybe we just have most of the play-dates at our house. The reality is that we have a gun problem in our country. We have a mental health recognition and healthcare problem in our country. I’m not here to debate either one of those things. But they are not as directly linked as some would like you to believe. I don’t have the answers and I don’t pretend to know what the best way to go is, but I veer on the side of kids here. 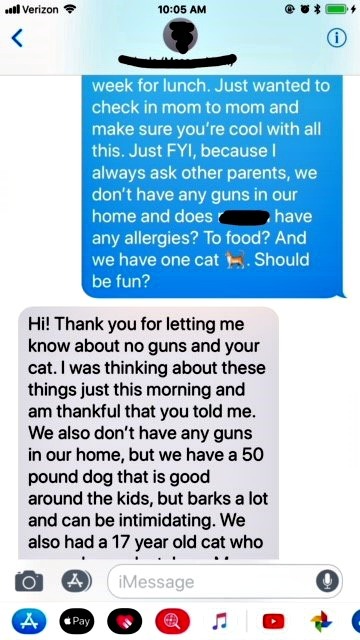 Kids and guns do not make for a fun play-date. Kids are more important than guns. We need to do something differently because what we’ve been doing is destroying too many lives. We live in an area heavily populated by police officers and firemen and it is pretty normal that many of these families have guns in their homes. I take no issue with guns safely stored and we definitely have visited several homes with securely stored guns and ammo and that is the way it should be. We have great neighbors and I trust many of them a great deal. I know that many families raise up their kids with firearms and hunting and this is their norm. I am not here to condemn you. I know many, many folks use and keep guns safely. I know that, and I’m thankful. We live in an area where these off duty police officers volunteer their time to patrol the grade schools to keep watch on our kids. I am thankful. So thankful. If you have guns, I know that by having these conversations it can spark some things. Maybe somebody needs to check and make sure everything is locked away safely. Maybe it moves people to buy a gun safe for the safety of their own family. Maybe it helps both of us feel a bit more at ease having had this conversation. Maybe it makes a relationship uncomfortable, but I’m willing to risk that. There have been too many shootings, too many kids with guns, too many accidents, too many lost lives and lives ruined forever to risk this. Guns kill nearly 1300 kids each year. Now is not the time to be casual and act as if everything is ok, because it isn’t. There are so many shootings and accidents that we tend to believe this is all just normal. This is not normal. How in the world can anybody think this is normal? Just yesterday we had another mass school shooting. a tragedy nobody, and I mean nobody should ever have to go through. Every parent around the country was hugging their child extra hard as they dropped them at school today. As I dropped mine, I saw the School Police Officer who – along with the Principal – stands at the door each drop off and pick up and addresses parents and kids by name. With tears in my eyes I said, “I’m so thankful you are here and care for all of us so well. Thank you for your service once again.” He was in a tender place today as well. This is a school with only 3,4, and 5 year olds. PLUS the incredible, numerous staff. Staff who didn’t sign up for this when they went to school to become educators and administrators and nurses and aides. I want to hug every teacher and staff member who now walks into class each day with a fear they should never have to face. They are not only shaping these kids lives, but also protectors in ways that are far beyond their pay-grade. I had the pleasure of chaperoning a field trip with my 5 year old twins classroom and their teachers a week ago. I watched them and their attentiveness to each and every kid. I see it every single day. The teachers and staff who show up day after day. We had off-duty Policemen with us on the field trip because this is how we live now. These angelic teachers have to do drills with 3, 4, and 5 year olds to teach them how to try to survive if there is a shooter in their school. I don’t know how they get the courage up each time to look at those faces and know what they are doing and remain calm and gentle. I admire them more than they will ever know. I don’t want to live in fear. I don’t want to live in fear. I don’t want to live in fear. DO SOMETHING DIFFERENT, LAWMAKERS, DO SOMETHING DIFFERENT. As a recovering alcoholic, we often talk about the definition of insanity – doing the same thing over and over again expecting different results. That’s what has gotten so many of us so deeply entrenched in our disease of addiction. Nothing changes if nothing changes. GOD DAMMIT. I am fearful and angry and so so sad that this is the norm for this country today when it doesn’t have to be. Thoughts and prayers are insulting at this point. Action and change are what’s needed. I’m mentally ill by definition. Many of my favorite people in the world are mentally ill by definition. I’ve never thought of taking a gun into a crowded area and killing people. I’ve thought about killing myself. Please don’t automatically link mentally ill folks with these people who use assault weapons and kill others. 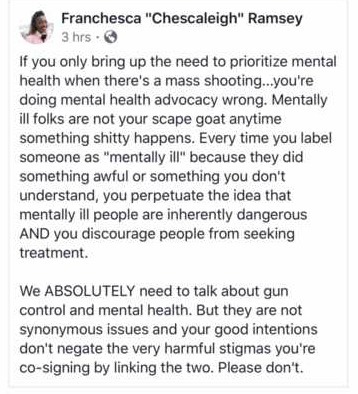 What makes more sense than linking these shootings to mental illness is to link them to toxic masculinity. 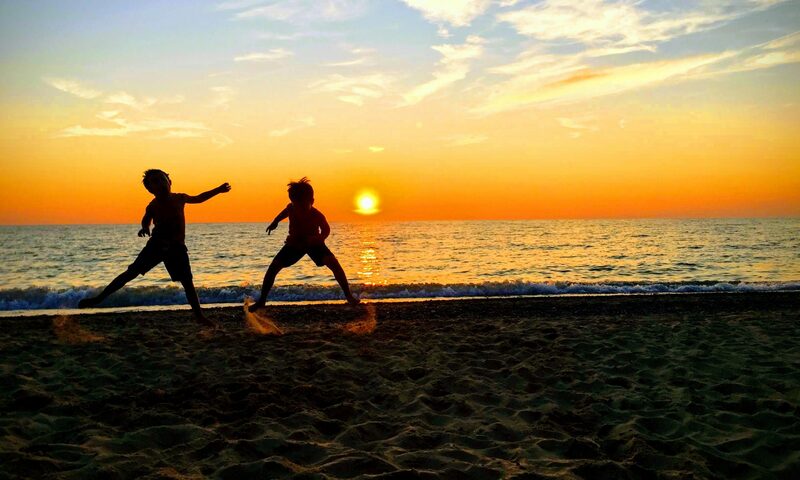 We have to teach our boys how to handle their anger, their jealousy, their rage, their insecurity. We need to keep smashing the patriarchy and do something different by getting more women in positions of power. Try something different. We need to get people the help they need and we need to get the right diagnosis and we need to get people the treatment they so desperately need. BUT WE ALSO NEED NEW LAWS ON WHO AND HOW PEOPLE GET GUNS. Vote for those standing up to change things. Vote for your interests, pay attention. Follow the money. This is not about parties or affiliations, this is about kids and people dying or living with the trauma for the rest of their lives. Vote for people who care with their actions, not their thoughts and prayers. Look out for each other. Look after each other. Check in. Listen. Talk and listen to your kids and your partners. Know your neighbors. Including the ones you don’t necessarily want to spend time with. This small thing is no small thing when you think these are the people most likely to cause harm in your community. In the last week I’ve watched my neighbors snow-blow our walks, talk me down from panic about our sick kids and guide me in the right direction as to what could be wrong (they were right), hugged our police, had cards and treats dropped in our mailbox for our wounded boy. I’ve watched all this as I get to know my neighbors for many reasons – comfort, community, building relationships with the kids our kids will grow up with, and knowing what the hell is happening right next door. 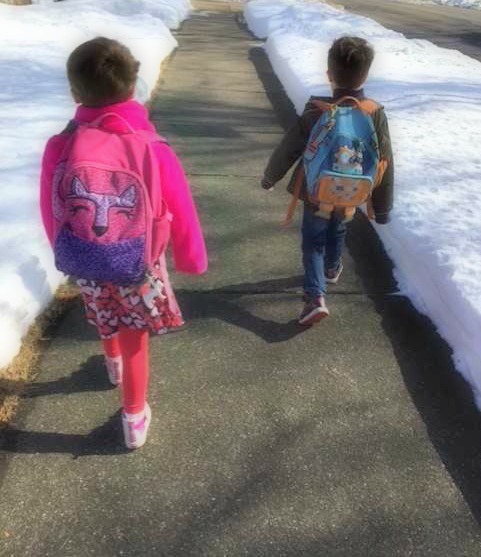 Most of us, and I mean most of us, just want to drop our kids off at school or a play-date and not ever have to worry about this ever again. It seems we are getting worse by the day in this country, even though we see the goodness and heart of so many folks all around us each day. With so many people wanting to end this, or at least change it, why can’t we at least try? Do not accept this. Do not bury your head in the sand. VOTE VOTE VOTE. RESIST PERSIST VOTE. Take care of each other and yourselves. I love you.